Krakow, Poland - Kazimierz is famous as the Jewish quarter (as per my previous post), but the western part of town has always been traditionally Catholic. Indeed, one of Krakow's most important churches is located here, on the banks of the Vistula River. This is the Church of SS Michael & Stanislaus - better known as Skalka, or "rock". This is the site of the martyrdom of the Bishop Stanislaw of Szczepanow, who is now the patron saint of Poland. Back in the 11th century, there was a power struggle between the Bishop and the King. Some sources claim that this was actually a land dispute, in which the bishop resurrected a dead land owner to act as a witness on his behalf. (That does not really seem fair.) Other stories say that the bishop publicly chastised the king for his immoral behavior - bad move. In any case, the dispute resulted in the excommunication of King Boleslaw the Bold, which didn't do much for his political career. The King decided to have the Bishop killed. I'm not sure Boleslaw really thought this through... did he really think that murdering the bishop would improve his moral standing? Nonetheless he went through with it. The story goes that Stanslaw was saying Mass at the Skalka when Boleslaw slew him, cutting off his head and hacking his body to pieces. Sorry for the gory details, but it's an important part of the story. You can even see the tree trunk where the bishop was beheaded, as it is kept in a glass case next to the altar. The parts were then tossed into the pond near the church. But upon entry into the holy water, the body miraculously reformed. Even today, this small pool near the church is said to have healing powers (though it stinks of sulphur). People were obviously awed by this amazing display - as if resurrecting the dead land owner had not been enough. The late Stanislaw quickly developed a sort of cult following. In 1245, his remains were moved to a place of honor in Wawel Castle and in 1253 he was canonized. Now he is honored every year on May 8, when the Bishop of Krakow leads a procession from Wawel Castle to the Skalka Church. He is the patron saint of Poland. And King Boleslaw the Bold gets nothin'. The Skalka has become a sort of a national shrine. The crypt contains the tombs of many of Poland's greatest cultural figures, including composer Karol Szymanowski and painter Stanislaw Wyspianski. And the grounds contain a monument to the Top Five Polish Saints. Buy you a beer if you can name them. Krakow, Poland - Krakow has seen a huge increase in tourism in recent years, and one of the drawcards is the city's Jewish heritage. Jews come by the busload - especially from Israel and from the US - to retrace their roots and to pay their respects to their brethren that were killed in the Holocaust. Even visitors who are not Jewish want to visit the old Jewish quarter Kazimierz. Much of Schindler's List was filmed here, and every tour guide knows where the scenes were shot and where Spielberg stayed. Last week on my bike tour, the guide even brought along a portable DVD player so he could show us a scene while we were standing in the very same courtyard where it was shot. The renewal of interest in Jewish heritage has led to a resurgence in Jewish culture in Krakow. There is a huge Jewish festival every year in June. The main thoroughfare of the Jewish quarter - ulica Szeroka - is lined with restaurants like Ariel and Klezmer-Hois - all of which promise Jewish cuisine and klezmer music. I'm not exactly a connoisseur of Jewish cuisine, but Avi - my friend from Israel - claims these restaurants are not really authentic. (When I asked him where to get the best Jewish food in Krakow he answered "Come to my house.") Most of the synagogues are not active - although some house bookstores or exhibits with Jewish themes. There are no Jews playing in those klezmer bands. In fact, the total population of Jews in Krakow is estimated at 200 (down from about 60,000 in 1938). There is a part of me that is put off by the phenomenon. I mean, I value authenticity when I travel, and this is clearly something that's being invented for the tourists. It seems sort of, well, fake. At least that's what I thought until I read an interesting interview with Chris Schwarz, founder of the excellent Galicia Museum in Kazimierz. He said that "... it's very important to keep Jewish culture alive to remind the country of what it has lost and what it still retains." It was 1264 when King Boleslaw invited Jews to settle in Poland. He recognized that their skills in accounting and administration would benefit his developing country, so he granted unprecedented rights and protections to the Jewish people. Slowly but surely, they started migrating east and settled in Poland, especially as they got kicked out of other places like England, Germany, Spain and Italy. Anyway, that's about 800 years of history and culture which are being sustained by about 200 people! I spent a day wandering around Kazimierz (sans tour guide) to discover "what it has lost and what it still retains." The Remuh Synagogue, founded in 1553, is an excellent place to start. This tiny building is the only functioning synagogue in Krakow, which is a pretty good indication of something that has been lost. But it is active. It's honors and remembers the celebrated 16th-century scholar Rabbi Moses Isserles Auerbach, who is buried here. Pilgrims still come to visit the grave and pay their respects to the esteemed teacher. This history has been retained. The Galicia museum is a few blocks off the main drag of ulica Szeroka. Schwarz was a British Jew who moved here in 2004 to open this museum (though he has since died). When I visited, there were several intriguing exhibits, but the best was a collection of Schwarz's photographs Traces of Memory. These contemporary photographs capture the remnants of Jewish culture in Poland today. There were the obvious Jewish cemeteries and Holocaust memorials, but there were also street signs in Hebrew and synagogues in ruins ... poignant reminders of what once was - what has been lost. But there were also snippets of contemporary Jewish life - festivals and fairs that are sustaining these memories. What has been retained. Krakow, Poland - The centrepiece of the central square, the Mariacki Cathedral has become the very symbol of Krakow. This Gothic beauty dates to the 14th century, but another church occupied the same spot for 100 years before that. Its interior is resplendent with stained glass windows by Wyspianski and murals by Jan Matejko, not to mention the elaborate wooden alterpiece. 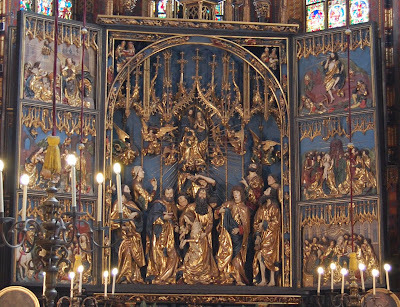 This masterpiece by Veit Stoss is considered the finest example of medieval art in Poland. Every hour on the hour, a bugler plays a haunting melody from the Mariacki steeple. The Heynal is a simple tune - just five notes - that dates back as far as the church. It is played four times, once in each direction, and was perhaps a signal of the opening and closing of the city gates. Some sources claim that bugle calls were also used to sound alarms. The tune ends oddly and abruptly, its final note cut off without conclusion. Nobody knows why, but it has given rise to an intriguing legend. The story goes that the bugler played the heynal to warn of an attack by marauding Mongols. As he sounded the alarm, he was shot, his heart pierced with an arrow and his warning cut short. It's a fantastic and romantic story that has been embraced by all of Krakow. In fact I have a painting hanging in my living room that depicts this legend. Alas, it is only a legend, I learned on my tour last week. Not only that, it was invented by an American writer, Eric Kelly, in his 1929 children's book The Trumpeter of Krakow. Leave it to the American to come up with a good story to market the city. From my flat, I can here the bugler playing the heynal. I can also hear the bells on Sunday morning calling me to Mass. But the rituals are the same. The community and even the music are the same. Connecting with people is connecting with God. And one way to make this connection is to share their rituals - the same rituals that I grew up with in a different language halfway around the world. Krakow, Poland - I finally did it. I dared to get back on a bike. It's been exactly three weeks since I finished my epic bike ride across Africa. And since I left my Bianchi in Namibia, I have not had any chance (or desire) to ride since I completed that 942nd mile. But I think I have sufficiently recovered by now. So I signed up for a bike tour of Krakow. Biking is almost always a great way to get an overview of a city. Certainly it is my favorite way to introduce visitors to Boston. Like Boston, Krakow is fairly compact. So when traveling by bike you can see almost all the sights of interest in a couple of hours. Four hours to be exact. Four hours traveling at a very leisurely pace, with many stops along the way. Just the way I like it. We started in the Rynek Glowny, the central square of the Old Town, in the shade of the Mariacki steeple. At certain times you can climb to the top of the steeple, I learned, but not today. Save that activity for a future date. From there, we pedaled out to the Planty, the park that circles the Old Town. Today I learned that the park used to be a massive wall - the fortification that encircled the medieval city. The wall was dismantled in the beginning of the 19th century, and now it is a pleasant green space. After circling the Old Town, we headed south to the Vistula River, which has lovely bike paths running along both banks - in on direction running as far as the lovely Tyniec Monastery. That bike trip is definitely on my list for future fun. For today, we rode a few kilometers south to Kazimierz, the historic Jewish quarter. There are only about 200 Jews living in Krakow these days - this down from about 75,000 before WWII. Nonetheless, it's still an important place for Jewish heritage and history. It's also an important place for drinking and nightlife - add that to the list for future exploration. Then we went across the river to Podgorze, which was the site of the Jewish ghetto during WWII, as well as the point of deportation for thousands of Jews. There are now a few interesting museums, including a new one that is housed in Schindler's factory of Spielberg film fame. Unfortunately it was closed (add it to the list). From there we headed back across the river and into the Old Town. The total distance was about 15 kilometers - almost 10 miles. It was not exactly the kind of mileage I am used to, but it was a great overview of the main sights of the city. At least it helped me to compile a list of places that I will be returning to explore in the coming weeks. Krakow, Poland - After 30-plus hours on airplanes and in airports, I arrived in Krakow, where spring is in full bloom. Considering the complexity of the trip - with stops in Singapore, Abu Dhabi and Frankfurt - everything went amazingly smoothly, with nary a delayed flight or lost suitcase. Incidentally, one thing I did to pass the time was to brush up on my Polish skills by listening to Berlitz language tapes. Yes, you read correctly... tapes. Just before I left my house so many weeks ago, I dug out the Polish tapes I had bought nine years ago before my first trip to Poland (and my first Lonely Planet assignment, by the way). Now what am I going to do with a cassette tape, I wondered? I know there is a way to digitize it, but I didn't have the time or the equipment to do it. Lo and behold, Jerry came to the rescue, digging out his old Walkman! And it worked! I stuffed it into the bottom of my bag, and it turned out to be the perfect way to pass the time and to aid the transition. Technology shmeknology. Touching down in Krakow, I moved into a little flat on the edge of the Old Town. It's quite charming really, with a view of the Florian Gate from my balcony. As you can read in your Lonely Planet guide, the Florian Gate is the only surviving gate from the city's old defensive walls. To be honest, I'm feeling a little lost here in Krakow. I'm not sure what to do with myself. I mean, I know I have a book to write, so there is plenty to do. But my days are wide open. When I wake up in the morning, I'm very aware that I don't have a train to catch, a workshop to attend or a hundred miles to ride. Very strange. Of course I'm never one to wallow too much in my free time. So I promptly signed up for Polish lessons and I had my first class last night. So it won't be long before I will striking up conversations with strangers on the street. 1 - People really do say "G'day Mate"
2 - Aussies are amazingly like Americans. I don't know why I had the impression that Australia was sophisticated. Seriously, my well-educated and well-traveled colleagues in Melbourne are not really representative of the population at large. Outside the LP office, most people I met were farmers, truck drivers and construction workers. Most had never left the island. Like America, Australia is so big that the locals don't feel the need to leave. Plus it is so far away that they often don't have the means. 3 - A vegemite sandwhich tastes kind of like beer on bread. 4 - I didn't see any kangaroos or koalas, but I did see kookaburras! And I heard them too. Laugh, kookaburra, laugh, kookaburra, gay your life must be. Brisbane, Queensland - Train travel is so civilized. Sure, it took me 20 hours to get from Airlie Beach to Brisbane, but they were 20 happy hours. I boarded the Sunlander in Proserpine around 9pm. The beds were already made up in my berth, so I read for a while but was soon lulled to sleep by the gentle rhythms of the train. When I awoke, the sun was up and we were whizzing along between Rockhampton and Gladstone - already halfway there. While I enjoyed breakfast in the dining car, the beds were converted into seats, so we were ready to start the day upon return to the cabin. I had some business to take care of so I spent most of the day working. Mind you, these were the best working conditions that I have had all week (much quieter and more comfortable than the common room at the hostel in Airlie Beach!) The scenery floating by was quite wonderful - farmland planted with pineapples, tomatoes and macadamia trees; rolling hills covered with brush; and vast plains dotted with rocky outposts. Arrival in Brisbane was a half-hour early! From Brisbane I am flying to Krakow (with three stops on the way!) for the next leg of my intercontinental journey. I only wish I could take the train there... Starting tomorrow, I am looking at about 30 hours in airplanes and airports, which somehow are not nearly so civilized. Airlie Beach, Queensland - For my last day in Airlie Beach I decided to frolic once again with the fish and the sea turtles. This time, the idea was to skim the surface in a sea kayak, cruising over the reef, but stopping here and there to snorkel and swim. Unfortunately the weather did not really cooperate. Once again, the wind was really strong, meaning the waves were big, the water was choppy and the turtles were sleeping. So there was no snorkelling or swimming – just hard paddling in choppy waters. And straight into a headwind, for starters. That was hard work! The waves were tossing us all over the place, splashing up into the kayak, pushing us precariously into the rocky islands if we got too close. Much of our route went across open water, which meant a flat-out fight against the wind. Exciting but exhausting! We paddled 2.5km out to a little island – unnamed and officially not an island but just a rock, according to our guide. Still, it was big enough to climb around and explore, with a cool lookout over the bay. After a picnic, we paddled back to the harbor. By now the sun was shining and wind was at our backs, so the return trip was more of the serene experience I was looking for. Still no turtles, though. We sailed in a small racing boat called Iceberg, with Luke as our skipper and Cam as deckhand. Iceberg is different from most of the other boats because it only takes 12 passengers, and it guarantees more time under power of the wind. Indeed, the wind was blowing at about 25 knots, which meant that we were chugging right along, often at a 45-degree angle, with water rushing up over the sides of the boat. It often felt like the boat was on the verge of tipping - or at least that you might tumble overboard if you didn't hang on tight. The water was a bit cloudy, but the array of colorful coral and flashy fish was amazing: giant irridescent clams, parrotfish in a million different hues, a huge napoleon fish and countless little colorful creatures that I will never remember, much to Jerry's chagrin. And yes, the ostentatious orange clown fish. After lunch we sailed to Langford Spit for a rest on the beach and another communion with the fish. That night we anchored in Cid Harbor, which was so peaceful compared to the winds we had experienced all day. I was a little worried about getting seasick sleeping on the boat... but in fact it was just like sleeping in a cradle, with the gentle waves rocking me to sleep. In the morning of Day 2 we sailed to Tongue Bay (where we saw sea turtles! ), which is on the backside of Whitsunday Island. From here was could go ashore and hike across the island to the stunning Whitehaven Beach. I had heard so much about this beach I was skeptical it would live up to the hype. But it was indeed one of the most spectacular beaches I have ever seen, just as Luke promised. It is a seven-mile strip of the finest white sand, backed by green forested hills and fronted by turquoise blue waters. Locals are justifiably proud of this pristine paradise. In fact, Luke explained that we had to anchor on the backside of the island because boats are forbidden from anchoring off the beach and spoiling the picture-perfect view. Not only is the place jaw-dropping gorgeous, it also offered the ultimate beach climate: hot sun, cool breeze and warm waters. I could have stayed in the water all day, riding the surf. But we had a schedule to keep. Onward to Dumbell Island and then homeward. The sail home was pretty exciting, as we sailed into a storm (just to make the experience really authentic - no whitewashed tourist experience for us!). So we donned our yellow slickers and toughed it out in the rain. I thought it was sort of fun but everybody was cold and wet (that was nothing compared to my last day of cycling in the rain and hail). Here I am doing an imitation of the Gloucester fisherman. Melbourne, Australia - I'm sure my faithful readers have been wondering what happened to me since I finished my epic bikeride across Africa. It's hard to believe that it has already been a week since Tom and I passed the virtual baton to Xiao Biar and Ethan Gelber, the next and final participant riding for the Lonely Planet team. These two are now en route from Windhoek, Namibia to Cape Town, South Africa, where they will ride across the finish line on our behalf. That afternoon I flew out to Johannesburg, and onward to Australia, for the next phase of my inter-continental journey. This week I have been participating in an author workshop at Lonely Planet's headquarters in Melbourne. I can't post any photos, unfortunately, since it's top secret stuff that has been going on here. But needless to say, it has been an incredible week. It's not often that we authors have an opportunity to interact with each other, so we really made the most of our time: working all day and playing all night. I have slept very little, but we all agreed that this is no time for sleeping. It has been exciting to meet LP's new CEO and to learn about some of the future plans for the company. Besides the regular workshop stuff, I have been answering editor queries about Boston, working with cartographers to prepare maps for Krakow, submitting the film footage we shot for Lonely Planet TV during the Tour d'Afrique and brainstorming ideas about future filming possibilities. It was a pretty shocking return to reality after a month in Africa. Now tell me the truth... you didn't really think I would come all the way to Australia without stopping in to see the fish at the Great Barrier Reef... did you? Tomorrow I fly to the Whitsunday Island for a week of sun and fun. Sadly I had to borrow a computer from LP so I can work on author queries while I'm there... but somehow I imagine they will be so much more tolerable when I am sitting on a beach!